Plymouth Albion have signed South African lock Dave Fisher for their forthcoming National One campaign. 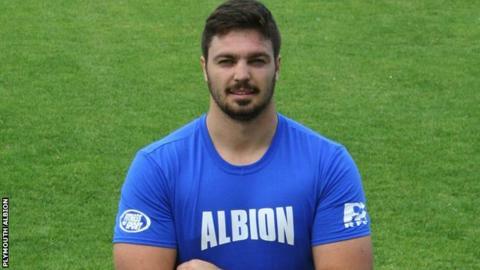 The 22-year-old joins Australians Marc Koteczky and Ethan Ford as overseas players at Albion. "Dave will bring physicality, balance and enthusiasm to our pack," said Albion director of rugby Graham Dawe. "He is an excellent ball carrier and also good in the set scrum. We have principally signed him as a lock but he can also play flanker." He is the latest player to join Albion as they rebuild after being relegated from the Championship last season. Launceston back-rowers Andy Chesters and Chris Courtier, as well as former Esher and Ealing lock Dan Collier, joined the club last month. Tom Bedford,Jake Murphy,Billy Searle,Matt Shepherd, Chris Judge, Nile Dacres and Jon Dawe are among the other players to have already moved to the Brickfields this summer.